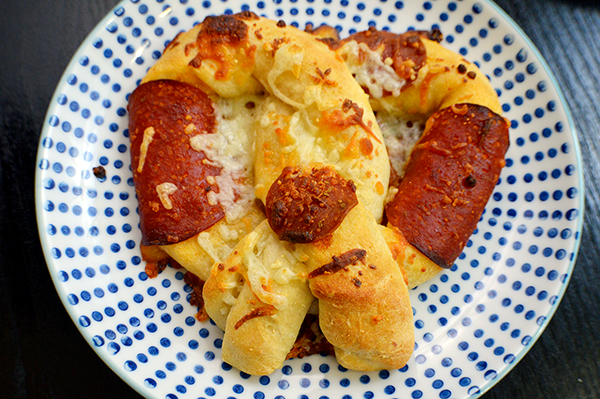 Pizza pretzels have become one of my favorite go-to meals during the week because it is so incredibly delicious and takes barely fifteen minutes to make from start to finish, which is perfect for those nights where you are just too tired to make anything else. 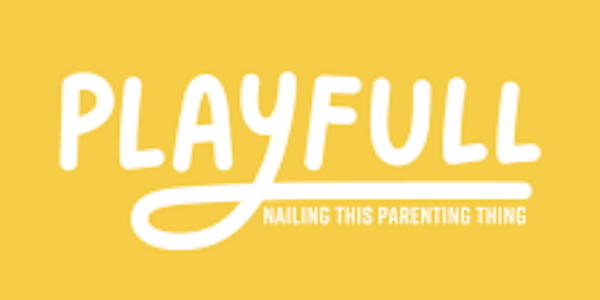 Plus, pizza is awesome. 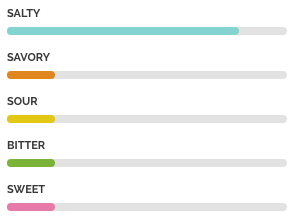 And pretzels are awesome-r, no matter what's stuffed in them. 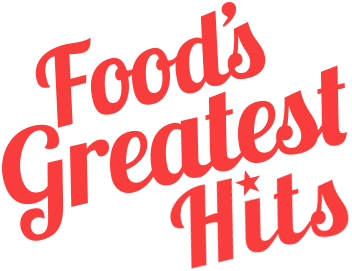 Together, they are a match made in easy-to-make recipe heaven. 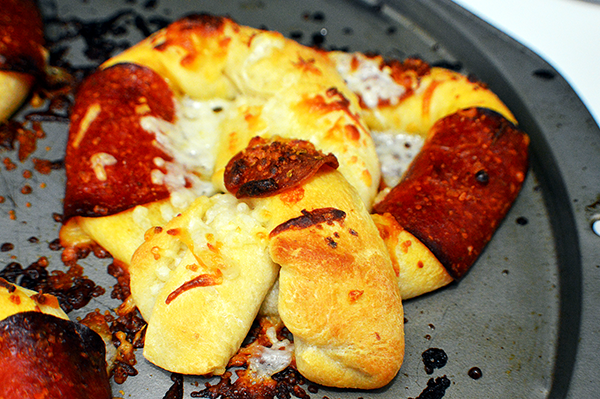 I used store bought pizza dough, the kind in a can, along with some pizza sauce and extra large pepperonis. The cheese filling is a blend of three cheeses, likely labeled as pizza cheese on the package, but regular mozzarella cheese works just as well. Begin by cutting the pizza into three strips. It's important the strips are thick enough to fold over the cheese and seal on the other side. I also stretched out my dough as far as it would go on every size. 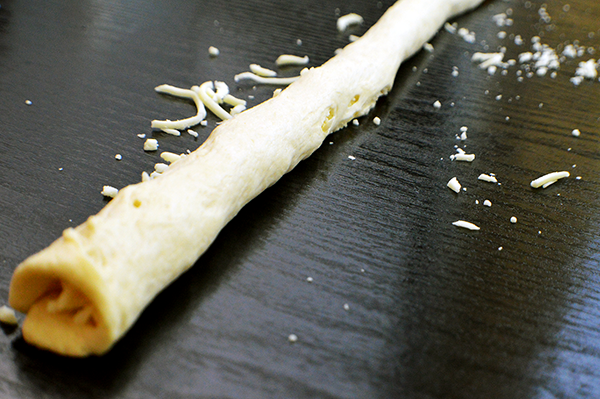 Take care not to make the dough too thin, however, or it might tear as you try to roll the cheese within it. Sprinkle the cheese down the center of one of the strips, then pinch the sides together so the cheese is closed within. Then, taking both ends of the pretzel, place both ends together and twist twice, then fold the ends of the twist over the center of the pretzel. 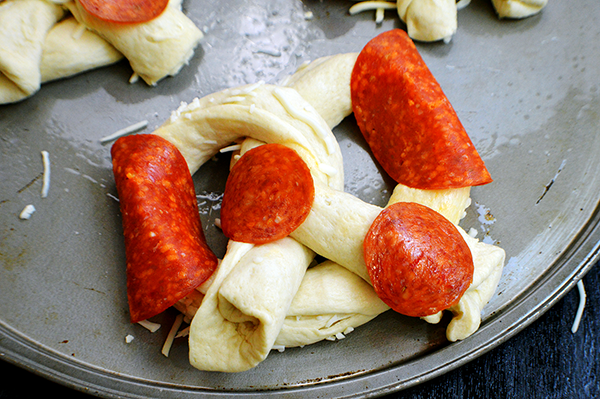 Top the pretzel with pepperonis and cheese. Bake for 8-10 minutes, or until the pretzel is golden brown and the cheese on the outside has melted. 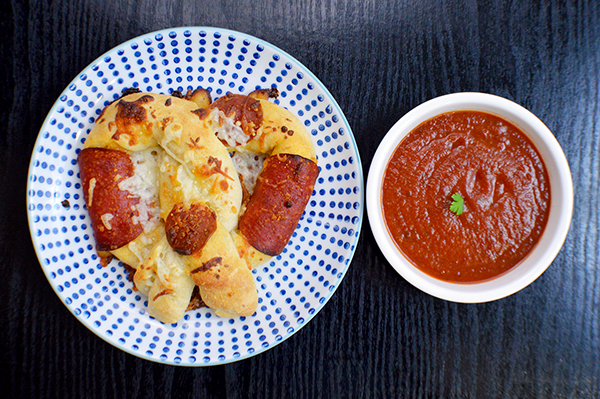 Serve the pizza pretzels alongside a bowl of warm pizza sauce and ranch dressing, if you are into that sort of thing. If you are able to find a good deal on pizza dough, grab it up! I keep a couple cans of pizza dough in my refrigerator at almost all times, simply so I can make pizza whenever I please without the hassle of making the dough - but you could totally triple or quadruple the recipe to make these for an event like the Super Bowl, a birthday party, or friendly shin-dig. Preheat the oven to 425°F. 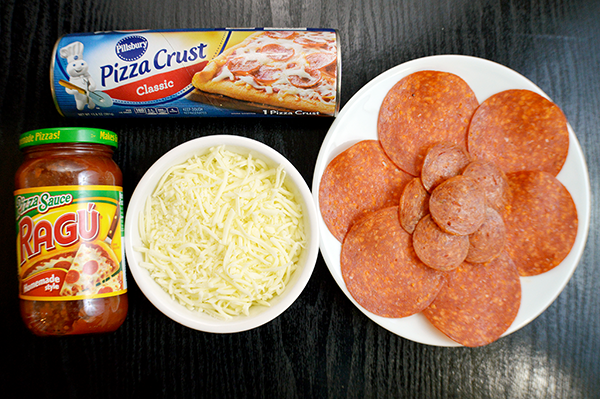 Open the pizza rough and roll it out on a smooth surface. Gently stretch the pizza so it has an even thickness from edge to edge. Cut the dough into three strips, longways. Sprinkle cheese down the center of each dough strip, so there is about a half inch of dough on either side of the cheese. Fold the edges together and pinch to form a seal. Grab the pretzel on both ends. Leave the center of the pretzel on the table as you bring the ends together then twist around twice. 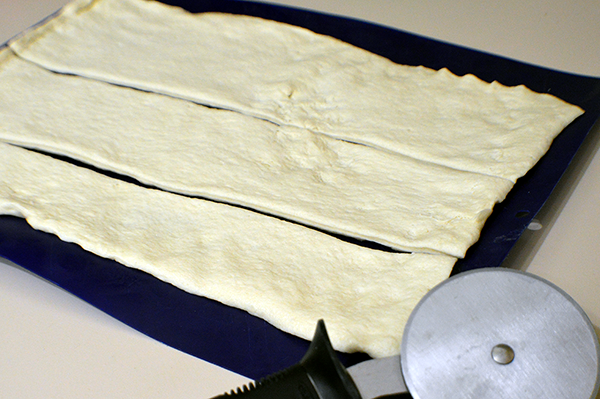 Place the twisted ends on the center of the dough on the table and gently press to make the dough stick to itself. 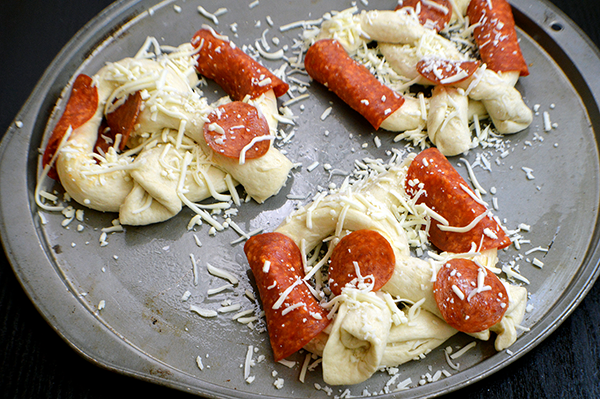 Press pepperonis onto the sides of the pretzels. Sprinkle the pretzel with the remaining cheese. Bake for 10 minutes, until the cheese on top has melted and the pretzel is golden brown. 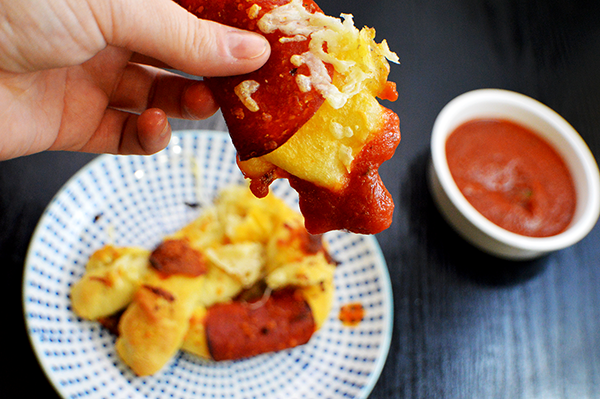 Serve with a side of warmed pizza sauce and enjoy!